I first migrated to CrunchBang Linux because they kept talking about it on Linux Outlaws. Specifically they mentioned how fast it was and, if I recall correctly, Fab was using it on his netbook. My laptop battery life was quickly dwindling so, if I wanted to be able to use it on a plane, I needed a fast-booting distro. I enjoyed Crunchbang and the neat way it was setup. I loved just hitting Win-W to launch Firefox. Conky was really neat Terminator was the best term program I’d ever used. But it was getting a little long in the tooth. The most recent stable version was at least a year old if not 18 months old. It wasn’t keeping up with the Ubuntu releases. I was stuck using Firefox 3.0 (or some other such old version) Then came the announcement they were switching to a Debian base. Even if I stuck with CrunchBang, I’d be forced to reinstall anyway. So I decided to give Lubuntu a shot. I knew Ubuntu was too resource-heavy for my crappy battery life. 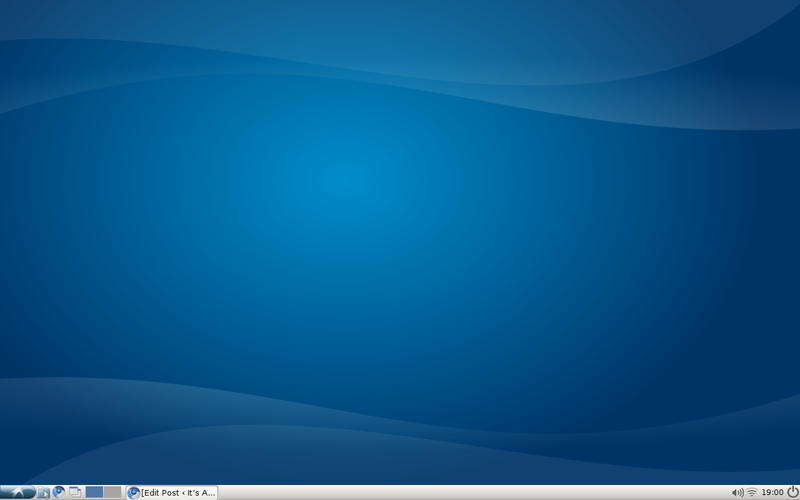 I looked around and Lubuntu seemed to be the lightest – even lighter than Xubuntu. Could it match CrunchBang? CrunchBang took ten seconds from login to usable desktop and about 30 seconds until wifi was up. I popped in the installation disc and wifi worked perfectly. The default theme looked very nice. I’ve commented before that I really like a nice distro. It just really speaks to me on a subconscious level. It doesn’t matter that themes are easily reconfigurable. I’ve always had a soft spot for Mandriva because of its great default themes. It succeeded in being fast enough. Login to a usable desktop took 6 seconds after entering my password. Wifi was also up in a reasonable amount of time after entering the password. No desktop icons by default, but I don’t care – there weren’t any in CrunchBang either. Leafpad was installed by default instead of gedit. Not sure how bloated gedit is. A text editor’s a text editor and I were going to do some coding on here, I’d just install emacs anyway. mtPaint is installed rather than the GIMP. I can understand this although I find mtPaint to be rather limited. If I need the GIMP I can always install it. Chromium is installed by default. Woohoo on that one. One of the reasons for wanting to upgrade was to get access to Chromium. I wasn’t sure if it would work with the older libraries. No flash installed by default, but it was an easy trip to Synaptic to get that. Pidgin is installed for IMing. I use it instead of Empathy already, so that’s a plus. Syphleed is installed for mail. When I’m on the road I just use gmail’s web interface because I don’t want to save emails to my laptop. I’ve heard lots of good things about it, though. Transmission’s installed for bit torrent. I prefer Deluge, but I almost never do any bit torrent on my laptop, so I don’t care too much which program is installed. Xchat rounds it off for IRC. I’m more of a fan of XChat Gnome, but it’s MOSTLY just a skin on Xchat, so that’s ok. The office section has Abiword and Gnumeric. That’s fine. I rarely do any word processing or spreadsheeting on th road. I had to click on Osmo to see what it was. Basically it’s the not-email part of Evolution or Outlook (if you’re from Windows). That’s actually pretty neat. Depending on how good OSMO is, I could end up ditching Evolution for Thunderbird or Syphleed. On my main computer. For sound and video they had Aqualung and GMplayer. (And cheese) libdvdcss was not installed by default. Installing that so I could play my legally obtained DVDs, I tried playing a DVD in GNOME Mplayer. It plays, but does not allow for the menus. Even after I installed libdvdnav (or something like that). Also, even though I had subtitles selected, it did not display them. Fine, I just installed vlc. Aqualung is a very disturbing song I discovered on Rock Band, it’s also a media player for Linux that I’d never heard of. So I launched it. It is neither the prettiest nor the most intuitive music program. I’d probably rather install xmms if I want something that minimal. Overall it works great – just as well as Crunchbang, but with update to date software. The only thing I didn’t like was that there was no update gui – I needed to run apt-get to find out stuff is ready for update – this also annoyed me with CrunchBang. Come on guys, every major distro (including Ubuntu, upon which it’s based) has some way of letting the user know there are updates to be installed. The user shouldn’t have to go manually checking every few days. Maybe you could also be interested in archbang? I’ll check it out. I didn’t have a very good arch experience, but maybe archbang will work out better. No update gui in Lubuntu? That’s odd. 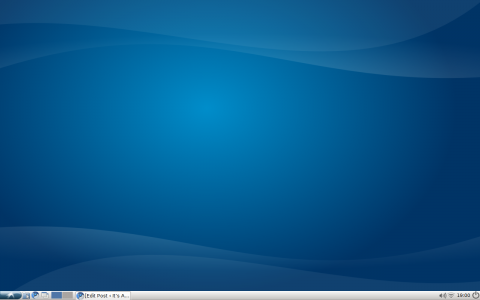 I am running Lubuntu (10.04) and it has Update Manager (listed in Preference). Until recently, I was using Peppermint One Respin but it got skewed after a kernel update. I have since moved to Lubuntu which is just as fast-booting and snappy as Peppermint. I have installed Prism, which is installed by default in Peppermint, so I am not missing anything in Lubuntu. Awesome distro! Weird. I don’t have it. In fact, on http://distrowatch.com/weekly.php?issue=20101011 it lists ” Improvements since Lubuntu 10.04: added Update Notifier to get notification of available updates”. I don’t want to call your Linux abilities into question, but perhaps you did a dist-upgrade or something? Try Linux Mint FluxBox release. I have it running on a Atom dual 330 media box. Very fast. GUI response times are great. 10.04 base OS. Highly recommended. I’ll keep it in mind for next time I switch it up.